Springtime is here—a season of longer days, warmer nights, and more opportunities to spend time outdoors. Frederick County offers plenty of options for family-friendly recreation, including walking the trails at Monocacy National Battlefield and cheering on the Frederick Keys, our local minor league baseball team. 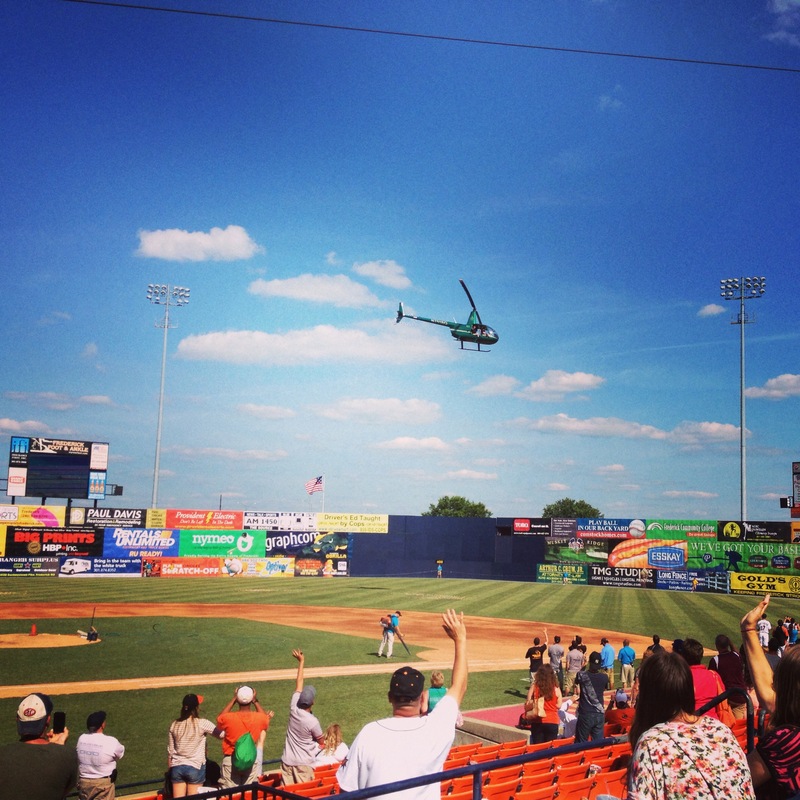 Fans of the Keys may know them for their crazy events like the cowboy monkey rodeo, 90s night, or the helicopter candy drop (pictured below). What they may not realize is that there is quite a connection between the Civil War and baseball. Various ball games were played in England and the U.S. starting in the mid-18th century. Baseball gained popularity in the 1840s as more Americans moved into cities, had increased leisure time, and formalized the sport’s modern rules. Although more than 50 teams had been established by 1860, the sport remained restricted to the upper classes. The Civil War facilitated the spread of baseball as soldiers moved from hometowns to battlefields and came to know—and love—the game. The sport offered entertainment during long encampments—and even imprisonment. 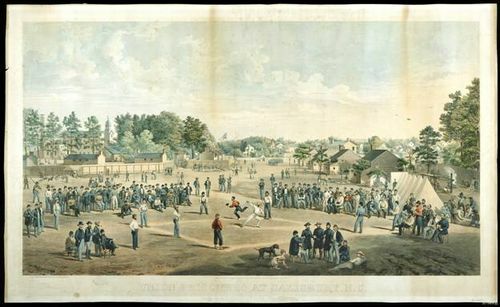 A famous lithograph in the collection of the Smithsonian’s National Museum of American History depicts Union prisoners of war playing a baseball game at Salisbury Confederate Prison in North Carolina in 1862. Throughout the war, the game became entwined with American identity. Soldiers stationed in Washington, DC played on the Ellipse in front of the White House and the grounds of the U.S. Capitol building. Baseball helped to boost the morale of weary men during the Civil War and led to its rapid growth in the later part of the 19th century. Fans may recall that Civil War General Abner Doubleday—who fired the first shots in defense of Fort Sumter and later gained fame during the Battle of Gettysburg—often receives credit for inventing the sport. His hometown of Cooperstown, New York is home to the National Baseball Hall of Fame and Museum. While baseball-loving Civil War buffs may cheer for the Doubleday connection, the historical record does not. Marketers touted this tale in the early 20th century without providing evidence to support the claim. I believe there is no better place to enjoy America’s pastime than in historic Frederick, where reminders of the past surround us. I love the fact that you can see the fascinating Mount Olivet Cemetery, the final resting place of nearly 40,000 Fredericktonians and home to three Civil War monuments, from Harry Grove Stadium. 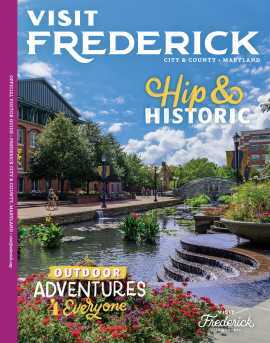 I recommend pairing a visit to the ballpark with a battlefield hike or stroll through Frederick’s historic district to hit a “home run” through American history. Auni Gelles is a Baltimore City resident who enjoys traveling to historic sites across Maryland both on the job and off. 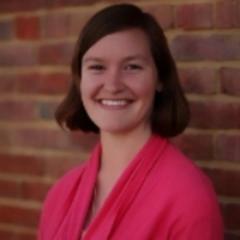 Auni serves as the Assistant Director of the Heart of the Civil War Heritage Area. Prior to becoming involved with Maryland's Heritage Areas program, she spent time in the New Media department at the National Museum of American History and working on history and literature programs at the Maryland Humanities Council.